Ars Technica has an article about the most accurate measurement yet of the mass of the electron. It was an interesting article, particularly in describing how the scientists went about making the measurement. This meshes with another observation I either read or heard somewhere that, unlike the development of quantum mechanics or general relativity, which came about to explain anomalous experimental results, much of the current work in theoretical physics seems aimed at finding a way to harmonize these theories. But much of the work in experimental physics seems aimed at trying to find places where empirical results don’t accord with those theories. 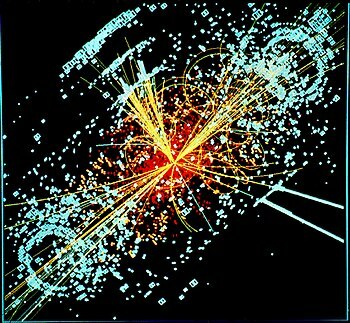 Along these lines, many physicists were actually somewhat disappointed when the Higgs Boson was found, because an anomaly would have shaken things up, perhaps leading to new breakthroughs. This seems like an extremely healthy attitude for the field to hold. I’m sure physicists should definitely continue attacking this from both angles, but I have a strong suspicion that the real breakthroughs will only come when the experimentalists start finding those anomalies, giving the theorists something solid to work with. Of course, only time will tell. This makes me even more convinced that talk of abandoning falsification as a criteria for science is misguided. This entry was posted in Zeitgeist and tagged accurate measurement, Ars Technica, experimental physics, Falsifiability, General relativity, Higgs Boson, Large Hadron Collider, particle physics, Philosophy of science, Physicist, Physics, Quantum mechanics, Standard Model, Theoretical Physics. Bookmark the permalink. I don’t think anybody is saying that it is not good to try to falsify theories or that it is not desirable for theories to be falsifiable. Sean Carroll’s point is that we should not dismiss out of hand ideas that do not appear to be falsifiable if there is good reason to take them seriously, and I agree with him. Likewise, I don’t think anyone is saying that those ideas should be dismissed out of hand, only that we should keep firmly in mind that it’s not in the same category as established science like the standard model or general relativity. To reach that point, those ideas will eventually need to generate some kind of testable statements. I think Carroll’s piece is a reaction to scientists who do want to dismiss such ideas. I don’t have a problem with not placing some ideas in the same category as the standard model or general relativity, but I don’t think the alternative ought to be pseudoscience or metaphysics. I think some theoretical physics forms a legitimate category within science which sometimes fails to make falsifiable predictions. I think some scientists are uneasy, not with the ideas being explored, but with how much attention they get. I have to say I share that unease. Metaphysics isn’t a dirty word to me, as long as we’re clear what we’re talking about. It is a dirty word for some physicists, but I suspect that’s their defensiveness about being lumped together with philosophers. My view of pseudoscience is actually narrower than many people’s. I think it’s too heavy handed of a word to refer to poor or speculative science. To me ‘pseudoscience’ is a synonym for ‘fake science’. It’s about someone who is making no effort to do real science, but uses the language and trappings of science to make it appear that they are. Ultimately, these ideas are like a speculative business investment that may eventually pay off, but isn’t currently. The speculative theories aren’t testable yet, but may eventually be. Whether or not any particular theory is a good prospect for eventually being testable is a matter of judgment, and disagreement.